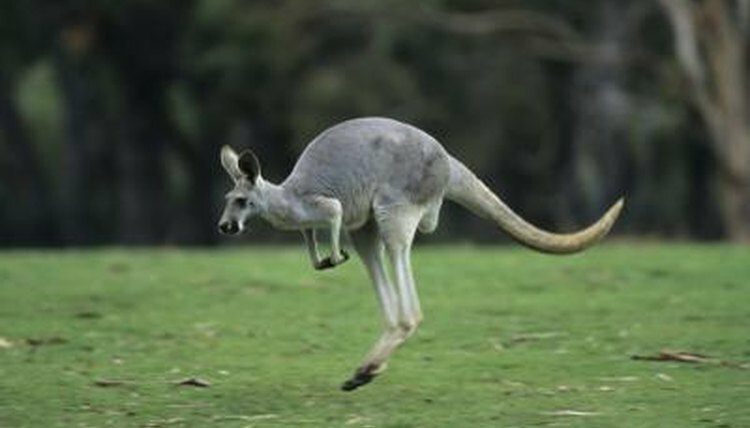 Both wallaroos and kangaroos belong to the same Macropus genus of macropods, and both are known for their large feet and hopping method of locomotion. Kangaroos include red kangaroos (Macropus rufus), eastern grey kangaroos (Macropus giganteus) and western grey kangaroos (Macropus fuliginosus). There are also three wallaroo species: black wallaroos (Macropus bernardus), antilopine wallaroos (Macropus antilopinus) and common wallaroos (Macropus robustus). Despite their many similarities, there are some key differences between these herbivorous marsupials. Generally, kangaroos are much larger than wallaroos. The largest wallaroos, common wallaroos, grow to over 5 feet tall and weigh around 120 pounds. Red kangaroos, in contrast, are the largest marsupials in the world, with males reaching heights of more than 6 feet and weighing more than 200 pounds. The smallest grey kangaroos may only reach the same height as common wallaroos, but at more than 150 pounds they're much heavier. Most wallaroos reach heights of between 3 and 5 feet and weigh between 50 and 100 pounds. Female wallaroos, on average, are about half the size of males. Red kangaroos are common in the arid territory of the Central Australian outback. Eastern grey kangaroos live in open areas in the eastern part of the mainland, while western greys occupy the southern and western regions. In contrast, black and antilopine wallaroos are found exclusively in the Northern Territory. Common wallaroos are widespread throughout the mainland but don't live in Tasmania. All occupy relatively small home ranges, with the notable exception of red kangaroos, which control home ranges of nearly 200 square miles. The larger kangaroos live in more open grasslands where they have plenty of room to graze, grass being the largest part of their diet. Red kangaroos favor open grasslands and the sparse, dry scrublands of the Australian interior, while greys live in similarly open grassy and wooded habitats. Being smaller, wallaroos browse and forage in less open areas. Common wallaroos, also known as hill kangaroos, prefer mountainous areas with rocky hills and outcrops. Black and antilopine wallaroos make their homes in Australia's tropical northern forests. Wallaroos and kangaroos are further distinguished by their social behavior. Kangaroos live in large groups called mobs. The smallest mob may only have around 10 members, but in good grazing conditions when vegetation is plentiful, mobs may grow to more than 100 kangaroos. In contrast, two of the three wallaroo species are mostly solitary creatures. Although they may be seen grazing in the same areas, they don't have any social ties to one another. Antilopine wallaroos are the only outliers. In the Northern Territory, they've come to occupy the same ecological niche as kangaroos in the rest of the country and seem to imitate similar behavioral patterns. Thus, antilopine wallaroos tend to be more social, but their groups are fewer in number, typically only including 20 or so wallaroos.